Although the UAE offers a plethora of dining options from across the globe, Greek cuisine seems to be missing from the list. Being a fan of Greek food and an avid Moussaka lover, I was therefore thrilled to discover ‘Eat Greek Kouzina’ at The Beach, JBR. Set by the beach with views of the sea, the interiors have been beautifully modeled to replicate the charms of rustic Mediterranean dining. Distressed wooden floors and tables laid out with gingham napkins. 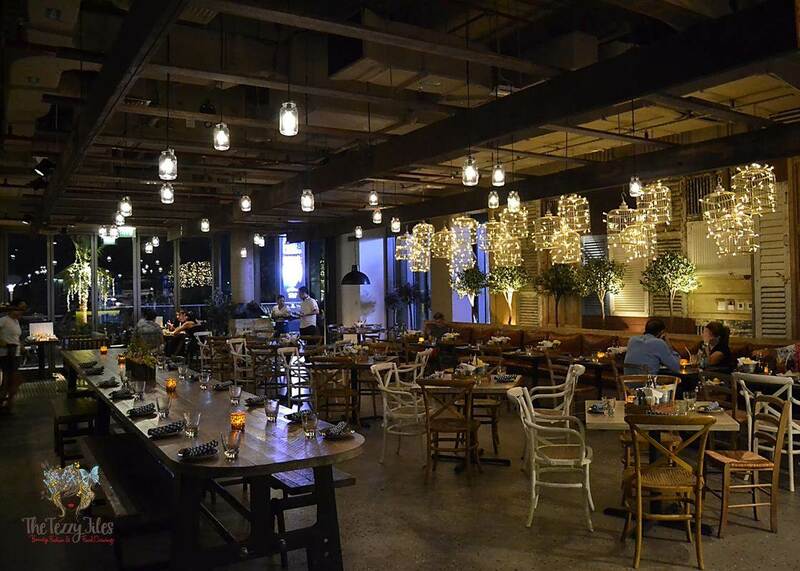 An open kitchen bustling with activity, and dainty fairy lights on birdcage chandeliers. This soulfully beautiful backdrop transports the senses to a magical setting in faraway Greece. We were hosed by the very friendly Sheryl who went out of her way to make us comfortable, and looked after our every need. While browsing through the menu options, we were presented with a complimentary basket of freshly baked bread. With a few drizzles of olive oil and balsamic vinegar, and a generous shake-down of dried oregano, this is a delicious start to the meal. For the appetizers, we went with Sheryl’s recommendations. We had the Eat Greek Salad, Tzatziki, Fried Calamari and the Baked Feta. 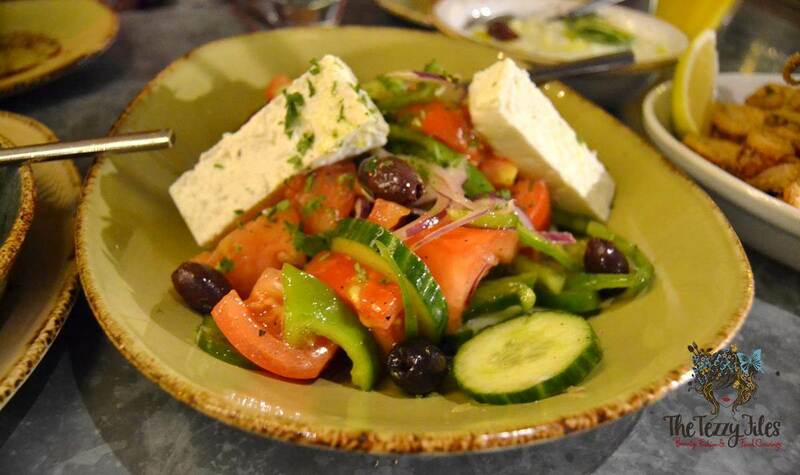 The Eat Greek Salad is a traditional feta salad featuring fresh slices of tomato, cucumber, onion, green peppers, a few salted black olives, chunks of feta and a generous drizzle of olive oil. It’s one of those super-simple dishes that are loaded with flavor, and make you think ‘I should be doing this at home’. Tzatziki is a Greek dip made from hung yogurt that has been whipped up with finely shredded cucumber and fresh herbs. This dip tastes very rich, yet it has a stark freshness of cucumber that makes it very summery. I could have a bowl of this all by itself! 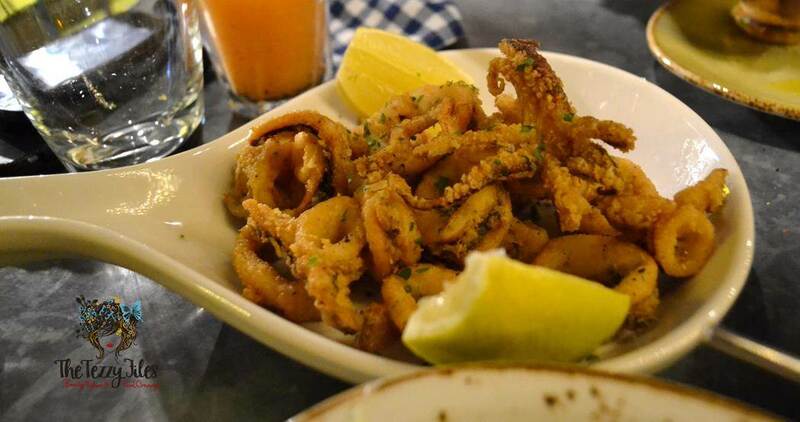 We enjoyed the Tzatziki with the beautifully crisp, golden Fried Calamari. The platter also included deep-fried battered Octopus. My favorite appetizer for the night was the Baked Feta. The slab of feta was still very warm when it got to the table, and this gave the cheese a decadently moreish texture that was all at once chewy yet soft. 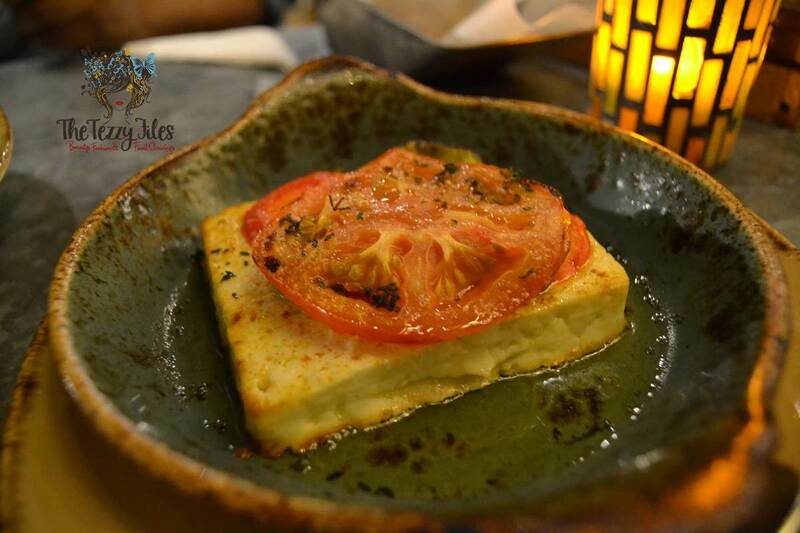 The saltiness of the feta was offset with the flavors of olive oil, as well as the baked tomato and pepper slices that garnished the dish. My daughter had the Orange Juice, which Sheryl tells us is from the Barakat brand and not made inhouse. 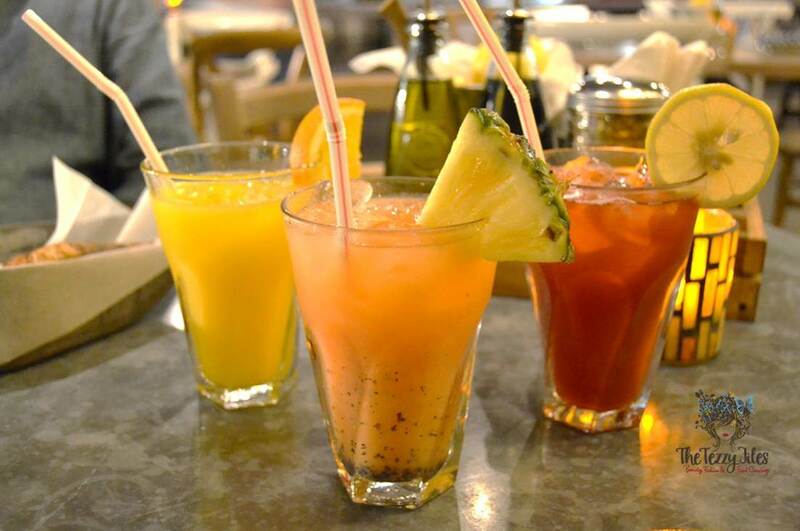 My husband had Exotica, a fruity blend of fresh pineapple, raspberry and passionfruit juices. My Raspberry Iced Tea was the perfect choice given the indulgent dishes we were eating; it has a berry refreshing flavor offset with the boldness of tea. No points for guessing what I ordered for mains. Moussaka it is! 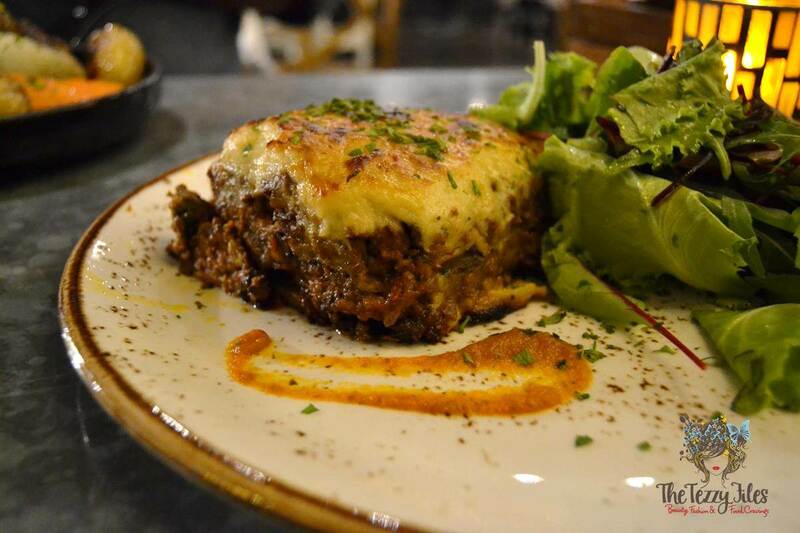 Eat Greek’s Moussaka is loaded with minced meat, and the bechamel sauce is sinfully rich and creamy. Generous portions of thinly sliced potato and eggplant layer between the sauce and meat, and every spoonful is meaty and satiating. The portion size of the Moussaka at Eat Greek is very generous, and I actually had to pack away the remaining half. 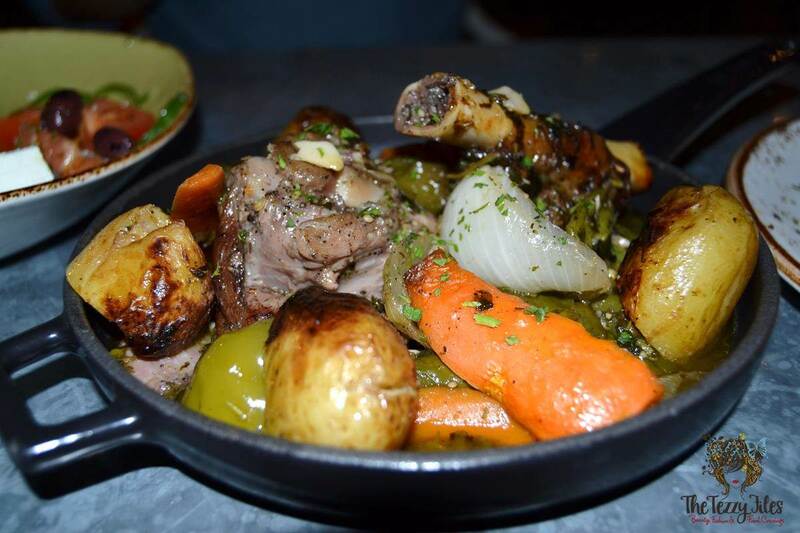 Hubby ordered the Kleftiko Roast Lamb, a Greek take on slow-cooked lamb shanks with roasted vegetables. The meat was just falling-off-the-bone tender, and the special blend of Greek spices coupled with the delicious mix of seasonal roasted vegetables ensured this pan was cleaned up in no time. Even my fussy 4 year-old was eating vegetables! By the time our Mains were cleared, we were too stuffed to move. Sheryl suggested the Greek coffee, a great way to rev up the digestion. I am in love with the quaint copper serving utensils! I had a single shot of Greek Coffee, and hubby went for double. Greek Coffee is very dark and robust, and can be likened to Turkish coffee, or Arabic Kahwa. 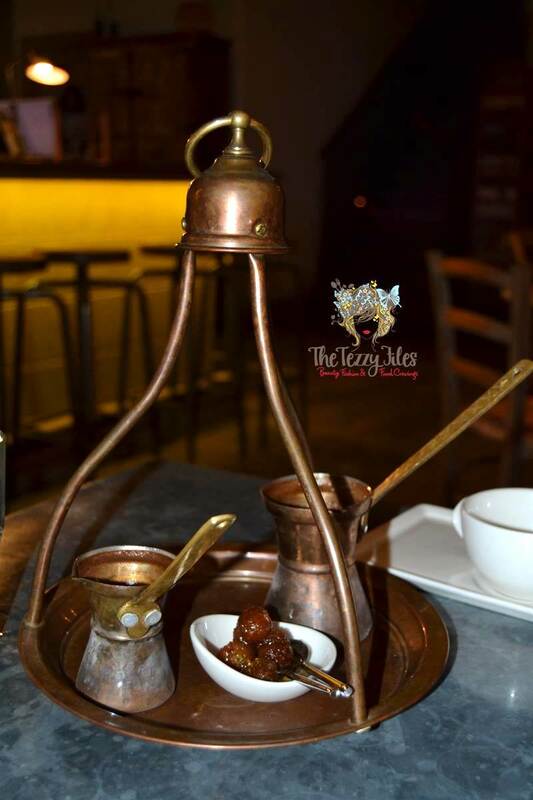 Instead of dates, Greek Coffee is served with dried candied figs. We decided to share a dessert, and went for Eat Greek’s best-seller, the Greek Orange Pie with Vanilla Ice-cream. Greek Orange Pie with Vanilla Ice-cream. This is not a ‘pie’ persay. It does not have a pastry base piped with filling. Rather, it is a dense mass of layered pastry that has been soaked with a very zesty orange syrup. This is a very rich, filling dessert and spoonfuls of the vanilla ice-cream help cleanse and cool the palette for more. If we weren’t as full from the previous courses, we could have finished this slice. Here I am typing out this post and wishing for some more! 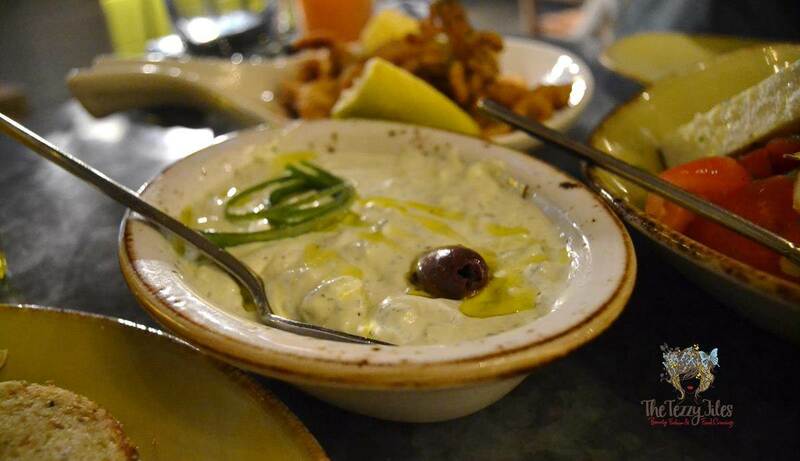 Eat Greek Kouzina currently only has one branch in Dubai at The Beach, JBR. A second branch is set to open in Mall of the Emirates by September. 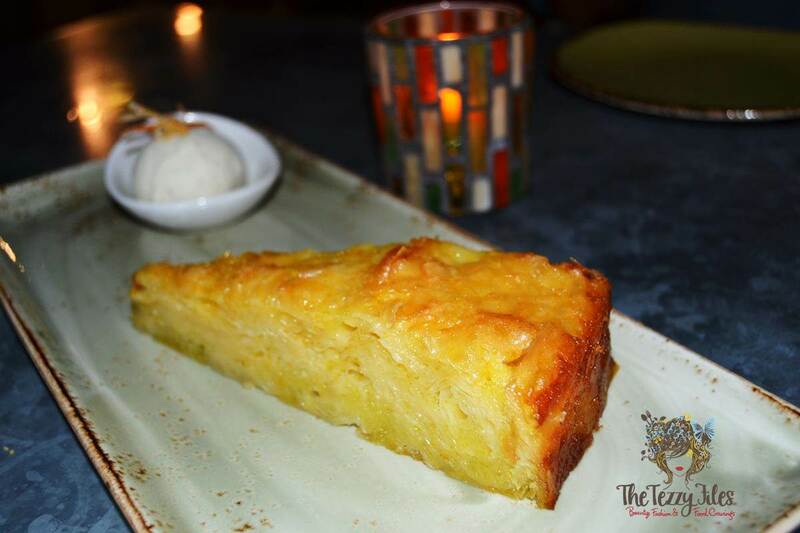 For a culinary tour of Greece right here in Dubai, I suggest you book a table at Eat Greek Kouzina today. Visit their website for details. Posted in Restaurants and tagged dubai, dubai restaurant, greece, greek, greek cuisine, greek food, restaurant, restaurant review. Bookmark the permalink.